(thanks for this to Garst and Bernstein’s Headlines and Deadlines). Headlines in Hebrew are even more likely to be confusing because Hebrew newspapers (like most reading material in Israel for adults and older children) are printed without vowels. Every morning during the recent primaries in the US I would be stopped dead in my tracks while I pondered why a Romanian (romani in Hebrew) had won or lost and why the candidate’s ethnic origin was at all relevant. After a second or two, of course, I would realize that the headline was referring to Romney, who I’m pretty sure has no Romanian blood. I am also often puzzled by headlines announcing an award to a different country almost every day. This is thanks to our tireless (may he live to 120) and peripatetic president, Shimon Peres, whose surname in Hebrew can also be read as pras (“prize” or “award”). Okay, so I didn’t stay up to watch the Oscars and I’m not up on all the awards given out these days. But surely it is going to an extreme to give prizes for performance in circumcisions. True, I’ve diapered plenty of babies and seen very different outcomes of brit performance, and I know that a certain ritual circumciser in Jerusalem is considered the bee’s knees, mainly because he hasn’t botched any performances in a major way. But I had to go to the subhead on that Time article to learn that the Brits in question are English-speakers like myself who are probably a lot less confused than I am about the nature of the awards in question, namely England’s annual pop music awards. And I’m sure you can do better than that, even if you’ve never had the pleasure of working for a newspaper. The Ten Commandments, the Credo, and the Lord's Prayers appear on the altarpiece -- in Hebrew -- in Christ Church, near Jaffa Gate. Al-Aksa Mosque: detail of Conrad Schick's model of the Temple Mount. Jaffa Gate, one of the main entrances to Jerusalem’s Old City, is a place of constant bustle. Yet just a few meters from the gate is an island of serenity, as lovely as it is unexpected. This is the compound of Christ Church, the oldest Protestant church in the Middle East, completed in 1849. It was built by what was then called The London Society for Promoting Christianity Amongst the Jews. 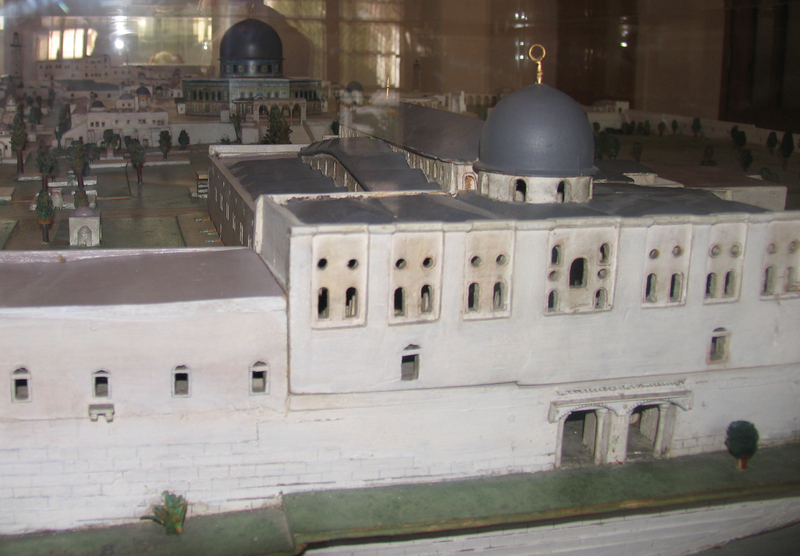 I visited the compound last week after learning that it has a new addition—a nineteenth-century wooden model of the Temple Mount—about which more below. 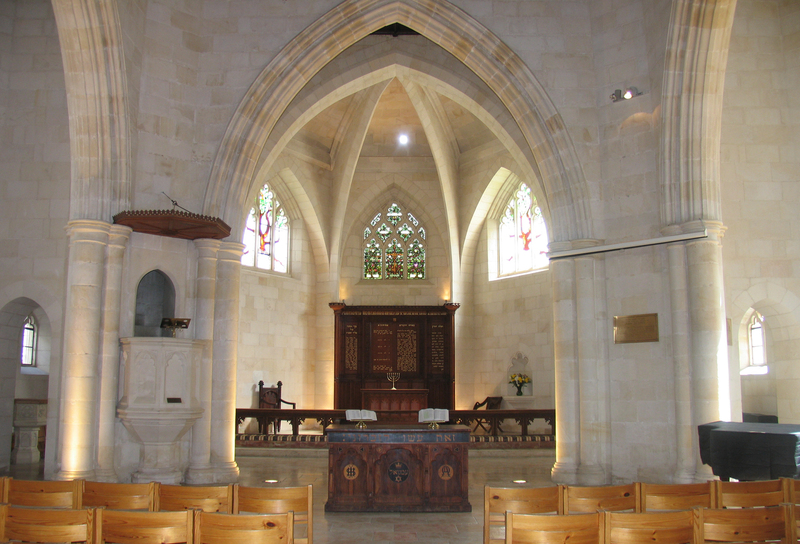 Stonemasons were brought from Malta to build the church, which is striking in its simplicity. Even more striking, however, is the altarpiece, on which the Ten Commandments, the Lord’s Prayer, and the Credo appear in Hebrew. A seven-branch menorah rests on the altar. No cross appears in the church, though the tree of life in the stained glass window above the altar is strongly suggestive of a cross. A Messianic Hebrew congregation also uses the facilities, which include a guest house and cafeteria with seating in a delightful courtyard (open to all). It took some negotiating to see the model, in a side room that is not yet open to the public. The model was built by Conrad Schick, a German architect, archaeologist, and missionary who also designed Mea She’arim, one of the first Jerusalem neighborhoods built outside the Old City walls and today the city’s most famous ultra-Orthodox quarter. Schick also designed the leper hospital Jesushilfe (near the Jerusalem Theater and just a couple of blocks from my house) which the city now plans to convert to an arts center. One of the models, built on a scale of 1:200, ended up in a mission in Switzerland, and recently Christ Church bought it and brought it to Jerusalem. Now it is displayed in a glass case alongside another model made by Schick, of Jerusalem in 70 CE. A church employee estimated that the models would be on view to the public in about two months, giving visitors yet another way to examine the site that has such a central place in Jewish, Christian, and Muslim belief and is so hotly contested by Israelis and Palestinians. On February 14 the Times of Israel made its debut on-line. Editor-in-chief David Horovitz is a former editor of The Jerusalem Post. The paper, which appears on-line only, appears to have something for everyone, and I wish it luck. The Earth Machine has already begun the magical process in our yard. Sharing the alchemists’ dream of turning dross into gold, I’ve long tried—about as successfully as the alchemists—to turn kitchen scraps into compost. The virtuous goal of not drowning our children and grandchildren in our garbage is but one element of the dream. The main thrust is that waste can be turned into something useful. 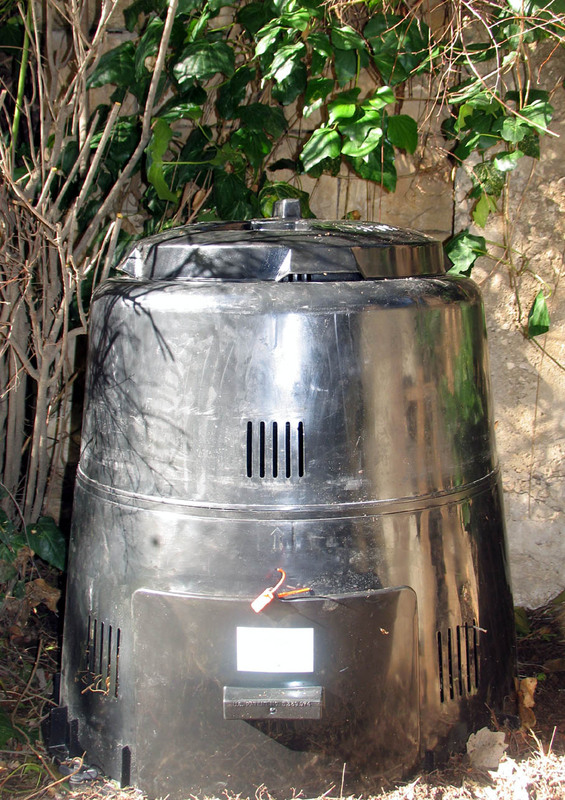 So when representatives of a local communal organization knocked on our door and tried to interest me in buying a composting Earth Machine, I agreed immediately. That was a couple of months ago. Yesterday afternoon the machine was ready for pickup. For a mere $18 I received one black plastic bottomless barrel, two plastic lidded buckets for scraps, and a large bag of “starter” material (complete with worms), and a promise of a steady supply of woodchips (to provide the nitrogen that is necessary for the process). This morning my husband and I assembled the barrel. It looked easy but it wasn’t. Tabs on the upper half have to fit into slots around the bottom half. By the time the sixth tab was fitted, the first two had popped out. With a lot of pushing, swearing, and banging we finally got it assembled, screwed in the four pegs to keep it anchored, screwed on the lid and slid on the lower door. We put a layer of twigs on the bottom to provide aeration, added the starter material, and put in some food scraps (of plant origin only). I am aware that a lot of plastic that will someday fill a garbage dump is involved in this process. That’s troubling, but not enough to keep me from following my dream. Check back in a few months to learn whether I’ve succeeded in beating the alchemists at their game. Runners from Indonesia, Trinidad and Tobago, China, and North and South America are among the entrants already signed up for the second Jerusalem Marathon, scheduled for March 16, 2012. The event includes a full marathon route, a half marathon, and a 10 km., and more than 1,000 participants are expected. An ice festival, with ice sculptures of key Jerusalem sites and an ice skating rink, will be a new attraction available during the marathon weekend. The Israel Postal Company has issued a stamp to commemorate the centennial of the cornerstone-laying of the Technion—Israel Institute of Technology. The Technion was the country’s first academic educational institute. The stamp features a rendering of the façade of the building that was designed by the German-Jewish architect Alexander Baerwald. Above the building, a nano-parachute, developed by three Technion professors and whose structure and movement are based on the structure of the dandelion seed and its movement in the air, rests on an open hand. Nano-parachutes change color in the presence of toxins and can save lives by making it possible to determine whether a site is contaminated, and if so, by which toxins. Photo and text copyright 2012 by Esther Hecht. No part of the text may be used without written permission of the author.